Book/Online Audio. Composed by Various. Sheet music with CD. Music Minus One. Classical and Play Along. Solo part only and accompaniment CD (softcover, no organ score included). With standard notation and introductory text. 38 pages. Music Minus One #MMO3840. Published by Music Minus One (HL.400076). A stupendous collection of 17th- and 18th-century pieces for trumpet and pipe organ- includes some of the most famous works by Handel, Purcell, Mozart and others- magnificent is the word! 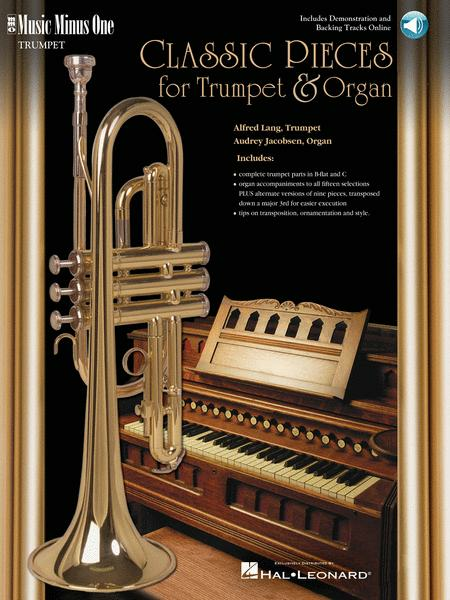 Provides a rare opportunity to have a huge pipe organ accompaniment at your beck and call, and includes B-flat parts for all compositions, plus special transposed versions of select pieces for C trumpet. This highly praised album includes extensive performance suggestions that provide a veritable treasure trove to trumpeters everywhere! 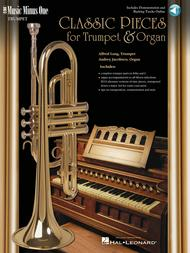 Includes a printed music book on high-quality ivory paper with parts for B-flat and C trumpets; and a digital stereo compact disc containing a complete version with soloist; then a second performance of all fifteen organ accompaniments (and nine bonus versions transposed for easier execution), minus you, the soloist. Soloist: Alfred Lang, trumpet. Ensemble: Audrey Jacobsen, organ. Very wel done performances. Tremendously disappointed there is no organ scores. MMO really missed it on that point. Makes me reluctant to trust their other offerings.
. These are fun pieces. This is one of the BEST sets from MMO. Very many pieces for Bb trumpeter in easy keys to play. 2 CDs (one with full instr. one for accompaniment)Excellent tempo, easy to play with. 15 of 36 people found this review helpful.